Spring and summer are the perfect seasons to enjoy seasonal fruit in new ways. 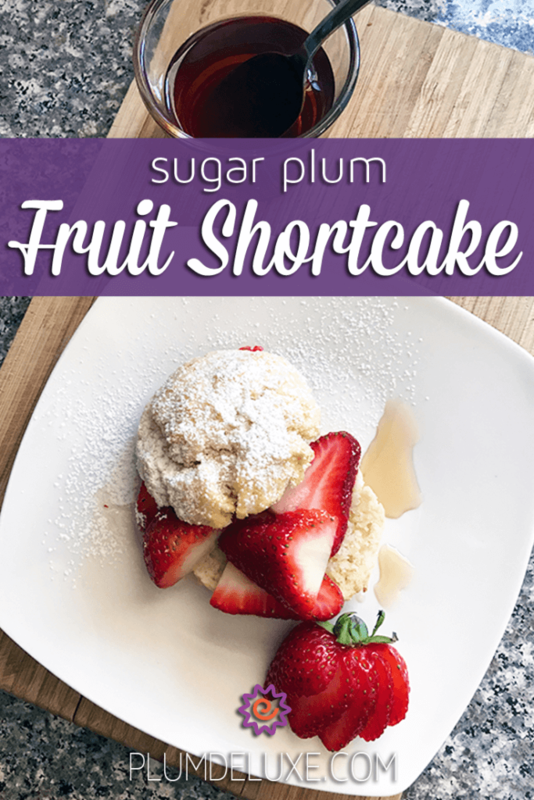 Try your favorite fresh fruit in this pretty fruit shortcake recipe flavored with Plum Deluxe’s own Sugar Plum tea. These shortcakes start with a lightly sweet cream drop biscuit made with heavy cream instead of butter. This keeps the biscuits moist and light and gives them a rich, delicate texture that perfectly complements the fruit topping. Using cream instead of butter means these biscuits are super easy to make — no cutting butter into the dough. 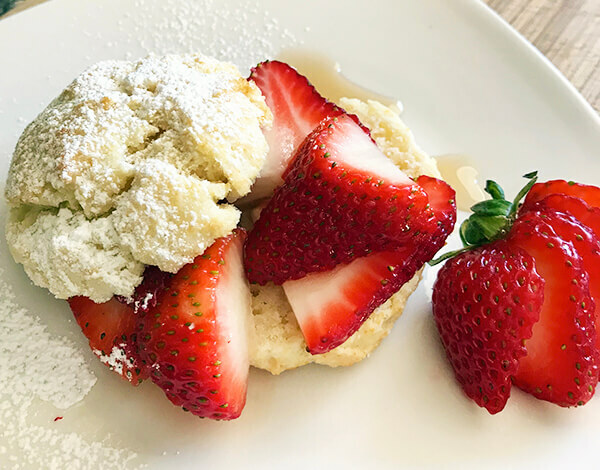 I used strawberries in this version of my fruit shortcake recipe, but I encourage you to use whatever fruit you like best. Peaches, nectarines, plums, raspberries, and blueberries are all terrific options. 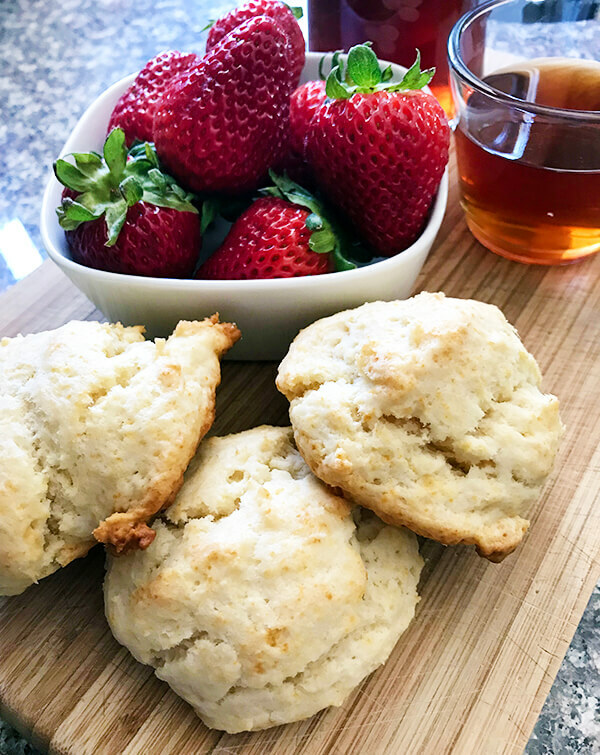 I like to use a little fresh orange zest in the biscuits, which adds a bright citrus flavor that pairs especially well with strawberries. 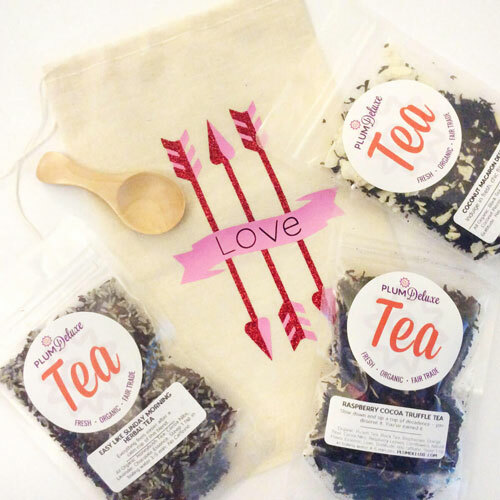 Play around with different flavor combinations! 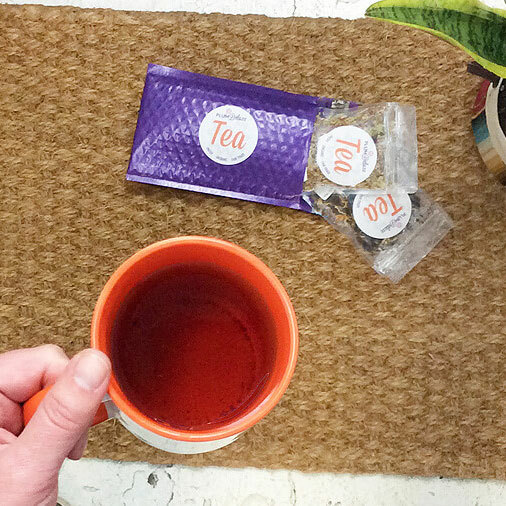 Try lime zest in biscuits topped with fresh raspberries, or lemon zest in biscuits with fresh blueberries. Don’t be afraid to mix and match — combine raspberries with diced peaches for a peach melba-inspired shortcake. 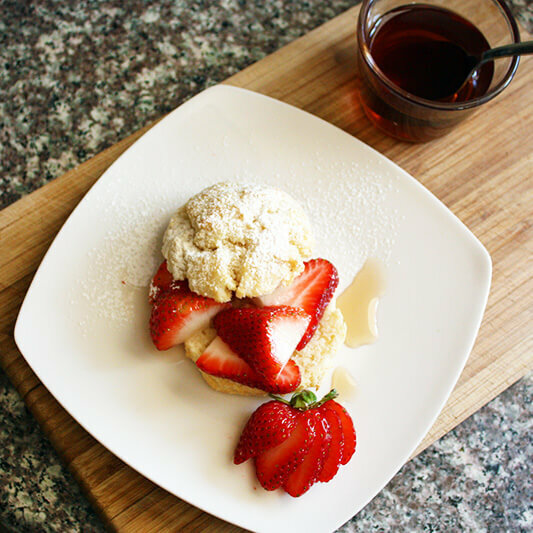 The beauty of this fruit shortcake recipe is how quickly it comes together. The cream drop biscuits are mixed in one bowl and don’t require kneading, rolling, or shaping. This is a great feature if your counter space is limited. If you have extra biscuits, wrap them tightly in plastic wrap, then foil, and freeze for up to 6 weeks. For the prettiest presentation and best results, you’ll want to assemble the shortcakes right before serving. You can make the biscuits earlier in the day — they’re best when they’re freshest. Berries can be quickly rinsed and picked over. Peaches and nectarines can be washed, pitted, and diced, then tossed with a little lemon juice to keep them looking fresh. 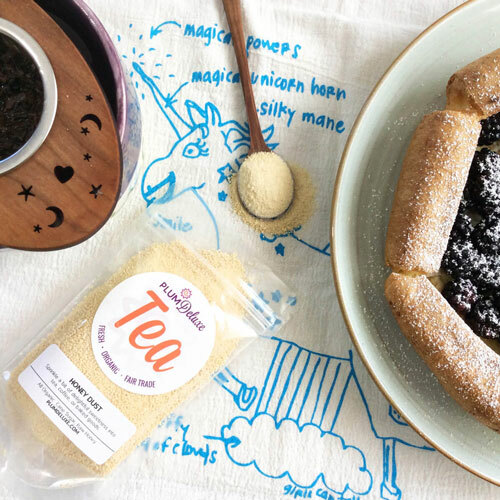 The Sugar Plum tea in the macerating syrup gives this dessert an elegant touch. Notes of plum, strawberry, cardamom, and lemon accent the flavors of summer fruits perfectly. The syrup can be made in advance. This recipe makes more syrup than you will need, but feel free to spoon a little extra over your fruit filling when you’re assembling the shortcakes. Any leftover syrup can be stored in the fridge for up to two weeks. Use leftover syrup for fruit salad or to replace simple syrup in sangrias and summer cocktails! In a medium mixing bowl, whisk together flour, baking powder, salt, and sugar. Using a fork, stir in heavy cream and orange zest (if using) just until a sticky dough comes together. Drop dough by 1/4 cups (I use an ice cream scoop) about 2 inches apart on prepared baking sheet. Bake in the middle of a preheated oven until just golden and bottoms are nicely browned, about 18 minutes. Let biscuits cool on a rack while you prepare the syrup and fruit. Steep tea in 8 ounces boiling water for 5 minutes. 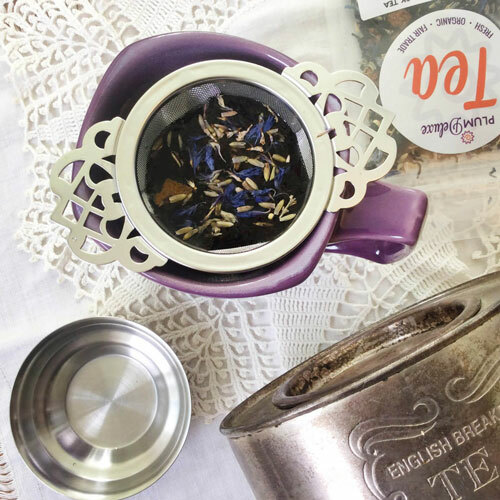 Strain tea and place in a small saucepan; add 1 cup sugar. Bring to a boil over medium heat, stirring, until sugar dissolves. Allow syrup to boil gently for 1 minute, then remove from heat and let cool. Place strawberries in a medium bowl, pour 1/2 cup tea syrup over, and toss gently to coat. Let stand 20 minutes. Split each biscuit and place bottom halves on individual serving plates. Divide fruit evenly among the biscuit bottom halves, spooning any syrup left in the mixing bowl overtop. If desired, top with an additional teaspoon of tea syrup. Place biscuit top over fruit and serve dusted with powdered sugar or a dollop of sweetened whipped cream. Refrigerate remaining syrup for another use.